Every house in the USA has a number of kitchen and laundry appliances, such as a refrigerator, oven, microwave, dishwasher, and many of them are used every day. Over time, each of these items needs a repair or replacement, which may be costly. There are two types of insurance companies that will help you bear the expenses—a home appliance warranty and an extended manufacturer’s warranty. We decided to find out what the best homeowners appliance insurance would be, and which are the best home appliance companies are. To do so, we have conducted a research that will specifically compare home appliance warranty and extended appliance warranty, and below you can discover our findings. What is a home appliance insurance (warranty)? As you may already know, a home warranty is a type of insurance that covers repairs and replacements of different home systems, such as electric, plumbing, heating, and air conditioning, as well as various types of home appliances. There are around 50 home warranty companies that provide home protection plans specifically for appliances. Those companies that offer the best homeowners appliance insurance usually include coverage for a washer and dryer, refrigerator, built-in microwave, dishwasher, oven or range, and garbage disposal. The top appliance warranty would also cover exhaust and ceiling fans, and a garage door opener. What is an appliance extended warranty? On the other hand, an appliance extended warranty, also called a maintenance agreement, is an option to prolong the manufacturer’s warranty that comes with a brand new item at the time of purchase. Among many other items, an extended warranty can be used for household appliances. Both the home warranty and appliance extended warranty have the same essence of paying a certain amount per specified term in exchange for a promise to repair or replace the item during the coverage period. So, what is the best home appliance insurance? What are the similarities and differences between a home appliance warranty and an extended warranty? Below we do our best to answer these questions. First, we decided to compare the availability of an appliance extended warranty (EW) vs. home appliance warranty (HAW) for the customers. For this purpose, we have collected information from different home appliance insurance companies that provided either type of warranty. For a home appliance warranty, we found a large selection of companies. Depending on the state of the residence, you may find between 20 and 50 home appliance warranty companies that offer HAW. Appliance extended warranty options are usually very limited. You can only get it via a manufacturer or a seller where the appliance was purchased. For this report, we selected 16 home warranty companies and three extended warranty companies: AIG WarrantyGuard, SquareTrade, and Assurant Solutions. These are considered to be the best appliance insurance companies in the industry. AIG WarrantyGuard is an appliance warranty company that works mostly with Whirlpool, a large manufacturer of various household appliances. These include refrigerators, ranges and ovens, dishwashers, microwaves, trash compactors, ice makers, and washers and dryers. For most of these items, you may purchase household appliance insurance when the original manufacturer’s warranty expires. SquareTrade is a household appliance insurance available on Amazon.com. 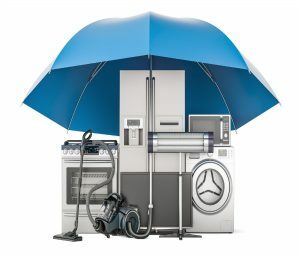 It offers 3- and 5-year complete appliance protection plans that cover mechanical and electrical failures as well as unexpected leaks. Assurant Solutions also offers extended home appliance warranty plans for your major kitchen and laundry appliances as well as televisions. All 16 home warranty companies that we selected provided coverage for home appliances comparable to extended warranty service plans. How do both types of appliance insurance cover similar items? In order to compare availability and coverage of a home appliance warranty versus an appliance extended warranty, we selected eight common household appliances covered by both types of appliance insurance. These items included a window air conditioning unit, washer and dryer, dishwasher, built-in microwave, refrigerator, stove, and water heater. We noticed that a washer, refrigerator, and stove were covered by all home appliance warranty plans and extended warranty companies. A dishwasher and dryer were covered by all EW and 94% of home warranties. Window A/C units and water heaters were protected by 75% of home appliance warranties versus 33% of extended warranties. All home warranty companies offered coverage for existing appliances; however, home appliance protection plans offered by extended warranty companies were only available for brand new appliances. Two appliance warranty companies offered extension options, once the initial coverage period has expired. 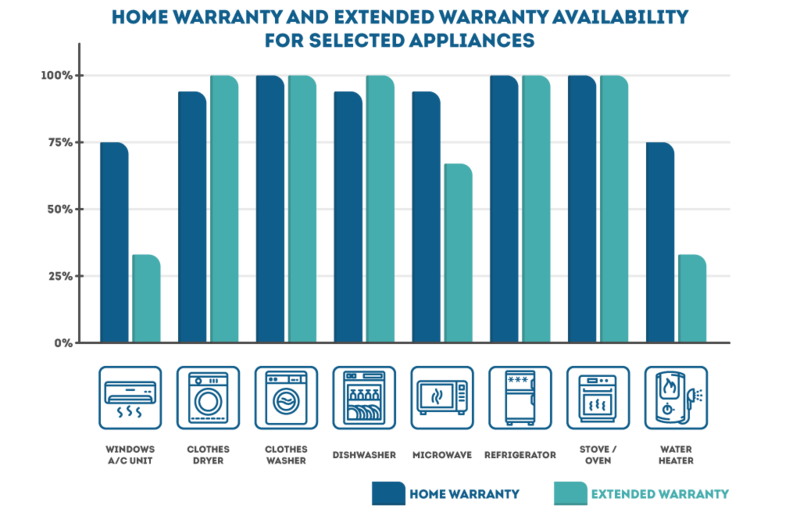 How do home appliance warranty plans compare to appliance extended warranty plans? While selecting a home warranty, you can choose among different home appliance protection plans. In every company, these plans vary by the level of coverage. According to our data, there is a median of three plans per company that we studied. It can be a designated appliance plan, like the Bronze Care Plan, for example, offered by Select Home Warranty, or a combo plan that offers not only complete appliance protection but also covers some home systems. In case the appliance that you want to insure is not included in any of the plans offered but you want to get the best home appliance warranty, you can add this item to your coverage from the optional add-on menu. For an appliance extended warranty, there is usually one plan that covers one particular item, so you can always choose which appliances to insure. Among 16 home appliance warranty companies, only one, Home Warranty Inc., offered a fully customized plan. Seven home appliance warranty companies offered limited add-on options for selected appliances. All other home warranties only allowed purchasing a pre-packaged home appliance protection plans. How does duration of coverage compare to both types of appliance insurance? Next question we were curious about is whether home appliance warranties and extended warranties have the same coverage period. We found that the typical duration of a home protection plan is 12 months. Some companies offer 1 to 2 months free to first-time customers making it 13 to 14 months long. In most cases, the home appliance warranty is extended automatically for another 12 months unless canceled. For the appliance extended warranty, the coverage is offered for 12, 24, 36, or 60 months with different companies. Usually, the customers have limited options to extend it. In case this option is available, you will be contacted by mail 30 days before the contract expires. What is a warranty premium? As with any type of insurance, a premium, or warranty cost, is what you pay for the term of the warranty. We decided to compare the appliance insurance cost for an extended warranty and a home appliance warranty. In order to facilitate the comparison, we calculated the effective annual premiums for the eight appliances listed above. Not all the companies in our research had the same coverage period, and they covered a different number of appliances.To make all the companies comparable to each other, we did the following calculations. For companies that offered different coverage periods, we divided the premium by the term and multiplied it by 12 months. For example, a company with a premium of $700 for 14 months had an effective annual premium of $600. We found that the median home appliance insurance cost was higher for an extended warranty, $562 vs. $524 for a home warranty. Also, an appliance extended warranty had a wider range, $306 minimum and $674 maximum, than a home warranty. What is a warranty deductible? This is the amount that you have to pay for each repair. Two of the three appliance extended warranty companies had a $0 deductible, and one had a deductible of $50. For the home warranty companies, deductibles ranged from $0 to $100, with the most typical value of $60. One of the first things that many potential warranty buyers search for on the internet is what other people say about these warranties. There are websites like Yelp, Better Business Bureau, and others, that collect customer reviews of different companies, products, and services. Browsing through these websites we found home appliance insurance reviews and ratings that the customers give to the companies. We studied what they praised, and what they complained about. First, we collected ratings for the extended warranty companies and averaged them. Next, we compared them with home warranty average rating from our database. We found that both EW and HAW ratings were low. This is a known phenomenon because happy customers for those type of companies rarely leave reviews on consumer reporting sites. They contact the companies directly. Overall, the ratings were slightly higher for the extended warranty companies. However, there were more complaints about them on purely “negative” sites like Ripoff Report, YSCAM, and Pissed Consumer. 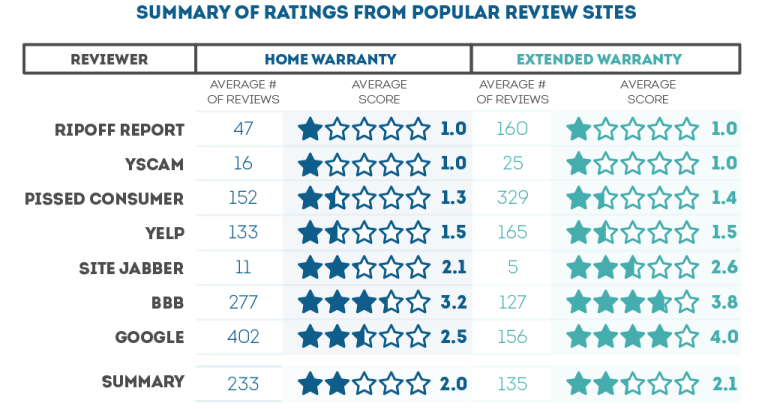 We studied a sample of 43 actual customer reviews for extended warranty companies. For each one, we selected the main takeaway points the same way as we do for home warranty company reviews on our site. Then we compared the prevalence of different takeaway points for both types of appliance insurance. We selected twelve major issues that the customers mentioned in their reviews. The most frequent was repair delay. It was stated in 31% of extended appliance warranty reviews and 16% of home warranty reviews. 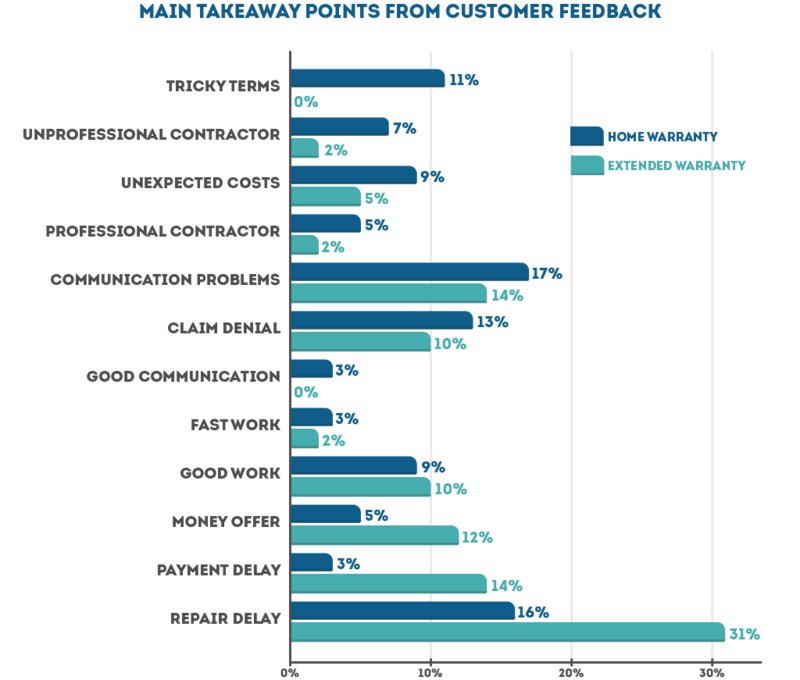 Payment delay was an issue for the 14% of extended warranty customers and only 3% of home warranty customers. Customers had communication problems in 17% of the cases with a home warranty and 14% of extended warranty reviews. Claim denial was mentioned a little bit more frequently for home warranties, 13%, than for extended warranties, 10%. Eleven percent of home warranty customers had problems with figuring out the terms, while extended warranty customers did not have such a problem. Happy customers cited good and fast work for both types of appliance insurance companies. However, 12% of appliance extended warranty customers were offered money when repairs could not be done, versus 5% of home warranty customers. In our search for the best home appliance insurance, we studied terms and conditions of 16 home warranty and three extended warranty companies that provided coverage for eight most essential home appliances. What would be the best home appliance warranty for you depends on your needs. If you are interested in insuring one or two items in your kitchen or laundry room, then an appliance extended warranty would be a good choice for you. For those customers who prefer to preserve their peace of mind by covering as many items as possible, home warranty companies will offer complete appliance protection. What you need to remember is that the best appliance extended warranty is only available to those customers who purchased a brand new item, while home appliance protection plans offered by home warranty companies will provide coverage for the item even it was purchased a while ago.